St Margaret’s Church is part of the Church of England and is situated on the NE corner of the intersection of St Margaret’s Road with Kingston Road. It is a church that is well integrated into the life of the local community, for which both Phil & Jim School and St Margaret’s Institute provide a major focus. Working together as a cohesive team, we promote high levels of respect and ‘service,’ demonstrated through the teaching of Jesus and rooted in our Christian values of Love, Compassion and Community. We aim to serve the community by providing education of the highest quality, embedded within a distinctive Christian ethos. Our school’s Christian character contributes to the achievement, personal development and well-being of all pupils. All members of our school community are valued and respected, so that everyone can have a positive attitude of themselves and others. Many of the children know the clergy well by the time they enter the school because of the weekly Toddlers’ Service held at the church on Friday mornings. That relationship is then strengthened through clergy visits to the Foundation Stage. Throughout their school careers, the pupils of Phil & Jim have many opportunities to connect with St Margaret’s Church and interact with the clergy. The clergy play a particularly important role in leading collective worship in school, taking both weekly assemblies and monthly values assemblies. Pupils visit the church regularly as part of the RE curriculum and attend services in the church for major festivals, including Harvest and Christingle. The clergy also take part in classroom sessions, and pupils are given an opportunity to discuss deep questions of faith and life with them. As Phil & Jim is a Voluntary Aided Church School, a majority of the School Governors are elected by the church. People of all faiths and none are welcomed into the school and our aim is to make all pupils feel at home in the “family atmosphere” of the school. The church-nominated Governors are involved in all aspects of the governance of the school and encourage a Christian ethos to be maintained in the school. Over the years, the clergy and parishioners of St Margaret’s have been a constant source of support and guidance for the school, which is deeply valued by the school community. 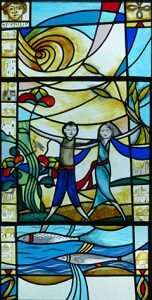 To celebrate its relationship with the school, the people of St Margaret’s gave Phil & Jim two beautiful stained glass windows, which are installed in the school hall.